Selling resources to Mesophon: How much is an AE worth? Mesophon pays 0.5 aes/ton for Hexacarbide. Hexacarbide has a supply-chain-adjusted WU cost (SCI WU cost is sensitive to the trillum cost of refining hexacarbide) of 5 WUs per ton at "abundant" frequency and 10WUs per ton at "major" frequency (assuming that the trillum supply is of the same magnitude as the hexacarbide supply) Abundant deposits of both trillum and hexacarbide are common throughout the galaxy, so we can easily assume that all of our traded Hex comes from abundant deposits. Mesophon pays 4 aes/unit for light jumpdrives. Light jumpdrives are made from trillum but are primarily a value-added product, with ~90-95% of their value coming from the WUs used to build them. This means a trading empire with poor planets can build light jumpdrives anywhere and resource deposits will form only a minor element of their ae value. Lets assume all our jumpdrives are using trillum mined at "major" abundance, which means they cost 80 WUs per unit. Clearly, a trading empire wants to exclusively sell raw materials extracted from abundant deposits, although selling organic food is also viable if there are more earthlike and ocean worlds than are needed to supply the extactor worlds. Worlds without abundant deposits should serve as hubs, foundations, infantry academies and citadels. Selling ship components is a sucker's game. Now what about buying? Buying ships from Mesophon: What will an AE get you? Mesophon ship sale prices are based on the OLD (era 2) ship power values. The ratio of AE cost to ship power was AEcost = era2power x 1.2, rounded to 2 significant digits. Anywhere "WU equivalent AE value" exceeds the rate you getting for selling minerals, you can buy that ship class from Mesophon more cheaply than you could build it directly! This is because a major element of ship cost is their direct unit WU cost; their resource WU cost can be reduced by using abundant minerals, but the direct WU cost is never directly discounted by any game mechanic. In a Mesophon purchase, you get to use 100% discounted WUs if that is what you are selling to Mesophon. For an empire selling "abundant" minerals at 10 WU/ae, pretty much any low-tech ship is available instantly from Mesophon at or below its direct-build cost using the same abundant resources! Since AEs do not undergo any attrition, if you sell resources for a week and then buy a ton of ships, you are also getting the equivalent of a full week of production all at once without the normal losses from attrition during the 1-week period, which I believe can be 30-40% depending on ship class (some calculus is involved). This is incredible, I'm going to build a T&E empire and ROFLstomp everyone How can we fix this? Change Mesophon's ship costs to reflect supply-chain inclusive WU cost. I recommend using the equation (AE_Cost = SCI_WU_major_abundancy_cost/8) * ((minTL+2))/10). This makes all ships slightly more expensive to buy than build even getting the best possible deal, but trading empires will still get the benefits of no attrition, instant fleets, obscurity (nobody knows how many aes you have) and not having to muck around with complex supply chains, not being dependent on chronimium abundance to get high-tech ships, getting capships in distant locations without having to ship them across the galaxy, etc. Adding a minTL modifier for ship classes makes high-tech ships slightly more expensive than their low-tech equivalents, which I think is a decent compromise since they normally require more complex economies to build. It might also be worth considering a very small "tax" (attrition) on AEs as well. Last edited by Watch TV, Do Nothing on Thu Mar 23, 2017 3:03 pm, edited 4 times in total. Definitely a major problem, I agree, but do you think George will have time to fix this as well? How easy would the new calculation be to implement? Additionally, if this can't be fixed easily (but I hope it can), how about limiting T&E to the old 2 capital 100 world secession limit, while S&H and F&M get 6 capitals, 300 worlds? L&O can have unlimited capitals and worlds. Trader empire ship prices are not in the era3 core library and are based on era2 power values that aren't found anywhere in the era3 library, so either they are hard-coded or the game is looking in the wrong library when calculating Mesophon prices. My guess is that they got determined by hand at some point and hard-coded, so the simplest fix in the short-term would to patch the code with recalculated prices. Ideally the game could pull these from the library instead rather than having them be hard-coded so that this sort of thing doesn't recur. I'm sure the 1000-unit costs could be rounded to the nearest 2 significant digits without screwing anything up, although a better solution would be to give per-unit prices and prompt for the desired number of ships to purchase. Note that capital ships are actually cheaper under this system. Starxplor posted a console command for bulk purchasing although I haven't tried it. I'm not totally sure how to phrase it. That is not a console command, that is an HTTP connection request. This is essentially what your browser is doing when you click the button to buy. In addition to this line other headers are needed, including cookies and post data. That data would include all the things needed by this api call. I am sure there is a way to modify the DOM with the console to change the buy/sell quantity, but I tend to skip the whole console and go straight to low level HTTP. I agree the prices need to be changed. Especially since they have no worlds anywhere near my new empire. And why do they have no worlds? Because they were conquered long ago? In the long run Mesophon needs a lot of work to make them viable. They need to be better able to defend themselves. Resources they buy need to turned into orbiting fleets. This implies that prices should fluctuate according to need, depending on whether each planet is short of raw materials or ships. Apparently any ships sold to Mesophon now end up in orbit instead of disappearing into thin air. So T&E empires would have an incentive to protect these worlds by selling them powerful ships. You're definitely right about people reselling ships to Mesophon- Evil Space Pirates used that strategy- although in practice it's difficult to defend everything. Resources bought by Mesophon do not disappear except to attrition; if you conquer a Mesophon world you will sometimes find a huge heap of hexacarbide because unlike other sellable resources it doesn't undergo meaningful attrition and Mesophon only uses a tiny bit for defenses. This gives all empires a perverse incentive to conquer Mesophon worlds in order to resell hexacarbide. Mesophon worlds ought to be able to allocate a larger % of WUs to defenses (and get the militia base structure or another infantry structure) to take advantage of this, and they should pass resources between one another better than they currently do. We saw Mesophon conquering worlds for a while a few months ago, but that might have been George testing stuff or somebody exploiting a bug. I think the root cause of the problem is pricing resources based on "major" worlds instead of "abundant" worlds. If I double the price of all resources, then it will balanced for abundant worlds, which means 1 aes will cost roughly 20 work units--as intended. With that change, I think all the other prices will be reasonable. Do you mean the price that Mesophon purchases resources for? If so, you would need to halve the price paid, not double it. This seems like it would work OK provided that you only do it for resources with role:rawMaterial. Ship and infantry component resources should not have their prices doubled since they are already priced appropriately, at nearly 1 aes per 20 WUs (it varies a little bit depending on what proportion of their supply-chain-inclusive WU cost comes from raw materials). A potential issue is that it might eventually be interesting to see designations, doctrines, planet traits etc. that slightly reduce the WU cost of producing specific secondary components - in such a case, these would be undercosted - but that's hardly a tremendous issue right now. 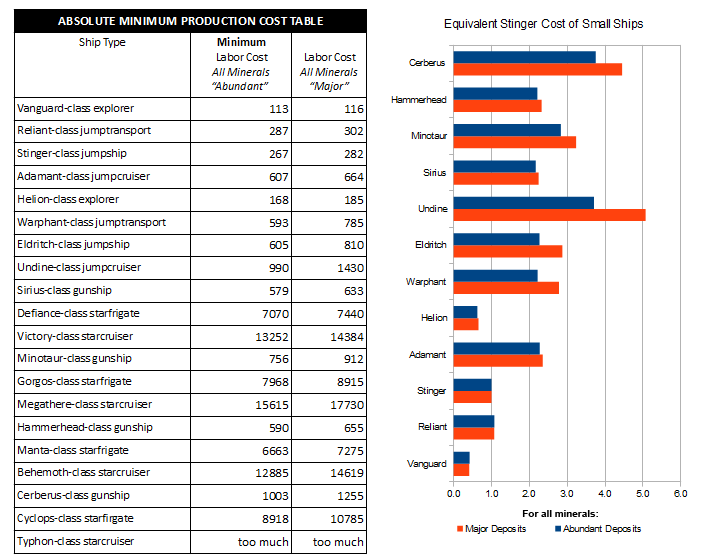 I was initially concerned that the price curve for ships is pretty uneven when you compare their costs to their converted or "supply-chain-inclusive" resource costs, even when these are calculated with "abundant" raw material frequency, and that it overprices some units (like starcruisers) relative to their production cost. However, this could perhaps be justifiable given the additional cost of maintaining the complex high-tech economy needed to produce these units via normal means. Another consideration is that with the new jumpbeacon system it's much harder for a non-T&E empire to casually trade with Mesophon since it ties up a ton of jumptransports for a long time to trade for even a small number of AEs if there is no Mesophon world nearby (you have to put them in a fleet with gunships). My first instinct would be to raise both jumptransport capacity and infantry mass simultaneously by a factor of 10- that way, infantry delivery for jumptransports will be unaffected, but an occasional Mesophon trade for non-trader empires will still be viable. Eventually it may make sense to introduce warptransports, ramtransports, or some sort of explorer-drive, gunship-speed transport that can cross into and out of nebulas. A system that I'd like to see return would be the capture/surrender of transports in space, not just their wholesale destruction. If I double the price of all resources, then it will balanced for abundant worlds, which means 1 aes will cost roughly 20 work units--as intended. Double the buying price or selling price of all resources? Either way we can try it out, deploy to server and see if it works. Sounds great! Also, did the Era 3 pull request get approved? Sorry, yes, you're right. I meant double the number of work units required to earn 1 aes, which means halving the price that Mesophon offers to buy your raw materials. And it would only apply to raw material resources (where "abundant" is relevant). Agreed. I'll do the Era 3 pull request as part of this change. Will you set up the new galaxy on Thursday's stream? It should also apply to organic food (a consumerGoods resource), since that can be obtained at 10 WU/ae from Earthlike and 11.43 WU/ae for ocean worlds (and something like 17 WU/ae from desert/empyreal worlds). These worlds are common enough that running fully agrarian T&E empires would become the optimal trade strategy. Alternately, Mesophon could be barred from purchasing food altogether.